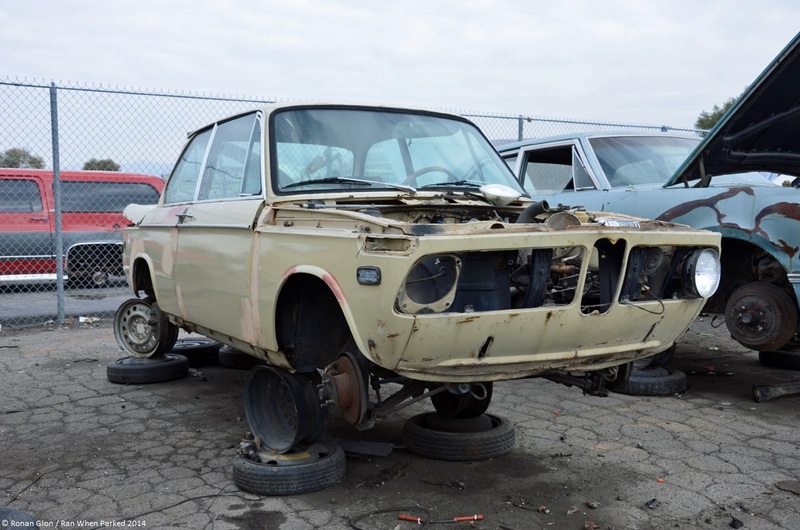 We photographed this BMW 1602 at a self-service junkyard in Salt Lake City, Utah, last month. The car was fairly picked over because it had been on the lot for a few weeks by the time we took the pictures but it looked like it was more or less complete inside and out when it was shipped off to the yard. The 1602 shows all of the tell-tale signs of a car that has spent the bulk of its life in Utah. Rust has started to chew through the metal in a number of places including around the turn signals, on the rear wheel arches, around the bumper mounts and at the bottom of the doors. Still, it’s not too far gone and someone with honed body-working skills could have undoubtedly brought this Neue Klasse back to like-new condition. Notably, the rocker panels and the floor were solid, though we admittedly forgot to look at the shock towers. Every time we find a car like this 1602 in a junkyard we wonder if it’s the last one we’ll see. 02 values have been going through the roof for the past few years, it’s only a matter of time before even the roughest examples are either saved for parts by collectors, put back on the road or fully restored. Tags: BMW, BMW 1602, BMW 2002, junkyard, Rust. Bookmark the permalink. the shock towers were rusted, though not as bad as some of the ones i have seen. I was there “hoping” that the cylinder head was in decent shape to pull and use to replace a cracked head on a 72 tii that i was working on at the time. The head on that car looked like it was is very bad shape. It appeared as if the oil had not been changed often and in addition the head was beyond use. While this one could be “saved” it would not be reasonable as prices are not high enough to justify it yet. A few weeks after i saw this one in the junkyard a vary original 71 one owner car sold in the area for just over a grand, while it too needed a decent amount of body work it was in much better condition. A hair over grand for a one-owner ’71? Wow, I thought the days of the affordable 02s were over. I remember a small repair shop on State and 8th (torn down a yearish ago) was trying to sell a dark blue 1970 in reasonable shape for $1,500 about 8 – 10 years ago, the guy had a hell of a time getting rid of it back then.